Ninjas were known as mysterious fighters in dark garb who trained in martial arts, espionage, assassination, and deception, and fortunately, there are many tourist spots in Japan where visitors can experience the culture and history of this class of Japanese warrior. Since the feudal era, Japan's ninjas have mystified locals and foreigners alike with their covert methods of warfare and strict rules of combat and honor. Potentially dating back all the way to the 12th century, the perception of this mercenary class has largely been influenced by folklore rather than historical fact, leading to a false conception of ninjas as those that possess special abilities like invisibility and levitation. 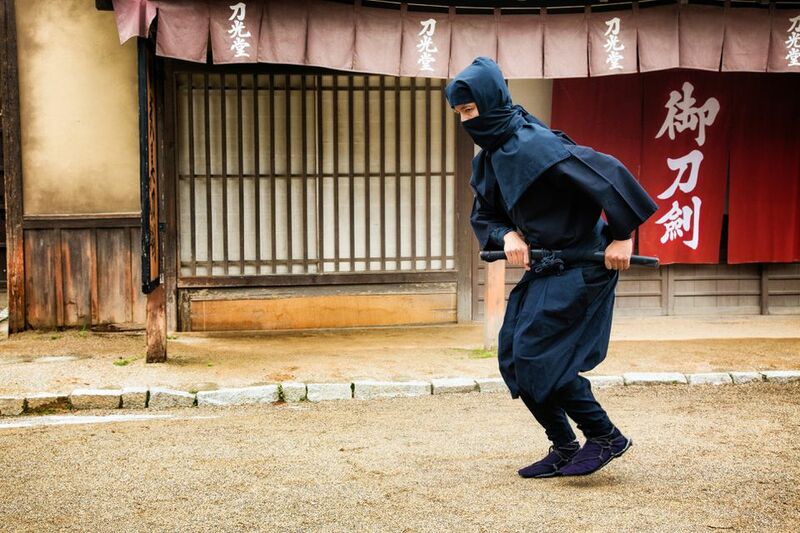 Whether you're a fan of museums full of ancient artifacts or prefer to immerse yourself in theme parks and ninja houses, the following locations offer a great selection of ninja tourist attractions in Japan. From the Iga-ryu Ninja Museum in the Mie prefecture to the Ninja Trick House in the Shiga prefecture, explore the following list and plan your next vacation to Japan. The Ninja Museum of Igaryu is located in the Mie prefecture of Japan, about two hours via train from Osaka Nanba Station. This small complex contains a number of attractions for visitors including a ninja show, a full gallery of videos that demonstrate ninja techniques, a museum of artifacts, and a house full of traps and fake hallways meant to dissuade enemies from stealing the former inhabitants' explosives. Explore the grounds and discover the ninja house, experience hall, tradition hall, and outdoor theater as you and your family learn more about the history and traditions of these fighters of Japan's past. Be sure to check out the gift shop, too, for some ninja gear you won't find anywhere else in the world. Open late April through late November and about an hour from Nagano Station via car, the Togakushi Ninja Village is an amusement park especially designed for children interested in the ancient art of bushido. Also known as Chibiko Ninja Mura, his Nagano Prefecture park offers kids a variety of hands-on activities and attractions—you can even rent ninja costumes for you and your kids! Basically, visitors to the park are immersed in the sacred art once taught at the nearby Togakushi-School of Ninja. With monthly contests, shows, and special events, this amusement park is sure to be fun for the whole family if you plan to stop by in the summer or early fall. For the more adventurous child or ninja-enthusiast adult, right in the same area as the Togakushi Kids' Ninja Village, the Togakushi Ninpo Karakuri Yashiki—or Ninja Trick House—offers visitors a thrilling look inside a maze-like, classic ninja dwelling. Also attached is a museum about the School of the Hidden Door—or Togakure-ryu—with over 500 tools on over 200 panels accompanied by explanations, photographs, and even videos of the customs and traditions of ninja life in Feudal Japan. You can also visit the nearby Togakushi Shrine, an ancient structure that ninjas once prayed at daily. Roam around this hidden village and discover the lifestyle of these Feudal warriors through the various attractions and activities including a ninja trick house, ninja museum, an obstacle course, and a pool where you can attempt to "walk on water" like the ninjas of folklore (but not real life). This village offers hours of amusement, and most of the obstacles are built for children rather than adults, so it's perfect for a day trip from Otsu or Nagahama for your family. The Koka Ninja Village also offers discounts on their website, so be sure to check out deals here when you're planning your trip around the Shiga Prefecture.